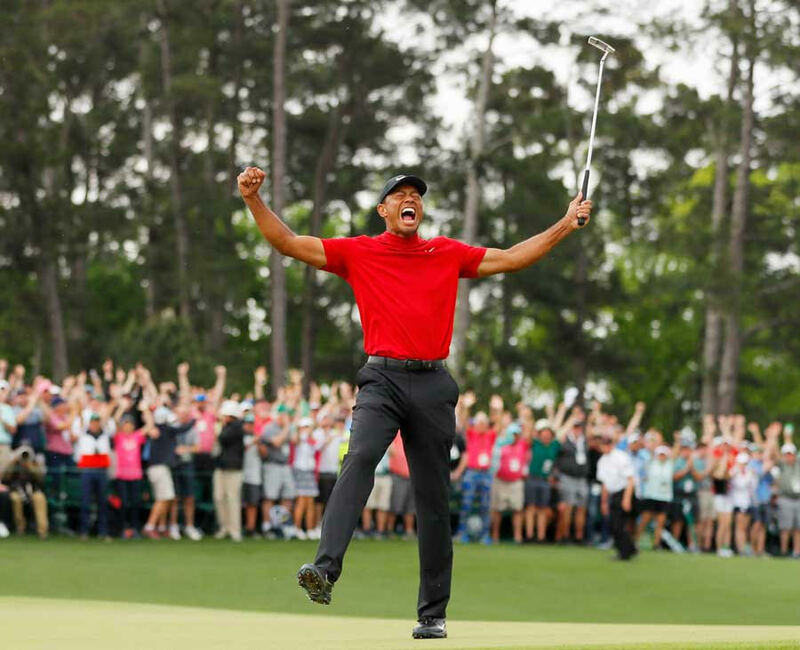 It’s only April but Tiger Woods’ victory at the Masters is already the sports story of the year, perhaps one of the greatest individual comeback stories in the annals of sports. When Woods sank his two-foot putt on the 18th hole to seal his one stroke victory at Augusta, the fans who had been urging him on all tournament exploded in applause. A jubilant Tiger plucked his ball out of the hole, raised his arms in victory and let out a mighty roar. After shaking hands with the competition, he ran into the arms of his caddy, smiling and clapping as if he had just won his first tournament, and then followed that up sharing big tearful hugs with his two children and mother. It’s certainly fitting that sports fans should celebrate the return of the greatest golfer of all time to the top, at the very course where he he first busted on the scene at age 22, winning his first major in 1997. Woods, 43, was referring to multiple back operations, including a spinal fusion surgery which he underwent in 2017, the slow recovery from which put his golf future on hold. In fact, his career first started going downhill in 2009, when stories of infidelity and a highly publicized divorce put his personal life in tatters. And in 2017, he was charged by Florida police for DUI, leading everyone to believe that he had hit rock-bottom. But through hard work re-shaping his swing, hours of practice and his fabled determination, the legend is back on top, winning his first Major since 2008. And it seems everyone — golf fan or otherwise — was cheering him on every step of the way. Nike, one of the few sponsors who didn’t abandon Tiger during his personal struggles, capitalized on his return to the top by releasing this ad that captures his extraordinary rise as a young phenom, his fall and his subsequent resurgence at the age of 43.. In carding a final round -2, to finish the tournament at -13, one shot ahead of Xander Schauffele, Dustin Johnson and Brooks Koepka, Tiger wrapped up his fifth Masters, one off the record set by Jack Nicklaus. He also won his 15th major, putting him three behind Nicklaus’ record of 18. He played steady, if not spectacular, golf carding 22 birdies, 9 bogeys, and no eagles or double bogeys. As he continued to hit greens and sink putts, and his opponents found water or went long, a crescendo started building in the crowd, as they sensed they were witnessing a historical moment. His winning putt touched off an ovation never before heard at Augusta. Presidents, great golfers, athletes and celebrities took to Twitter to congratulate Tiger on his magical performance.